After the billion dollar successes of both Avengers Assemble and Iron Man 3, Marvel’s ‘Phase Two’ continues with the highly anticipated Thor: The Dark World. With Game of Thrones director Alan Taylor replacing Kenneth Branagh at the helm, the sequel serves up the thrills as well as the laughs in what is an enjoyable superhero outing. Much like Branagh’s franchise opener, The Dark World begins with Anthony Hopkins’ Odin narrating a prologue before we catch up with Thor (Chris Hemsworth), who’s been busy on cosmic peacekeeping duty post-Avengers. When an ancient race led by the vengeful Malekith (Christopher Eccleston) resurfaces on the hunt for a powerful weapon that could destroy the universe, Thor must ally with the mischievous Loki (Tom Hiddleston) if he is to save the Nine Realms. 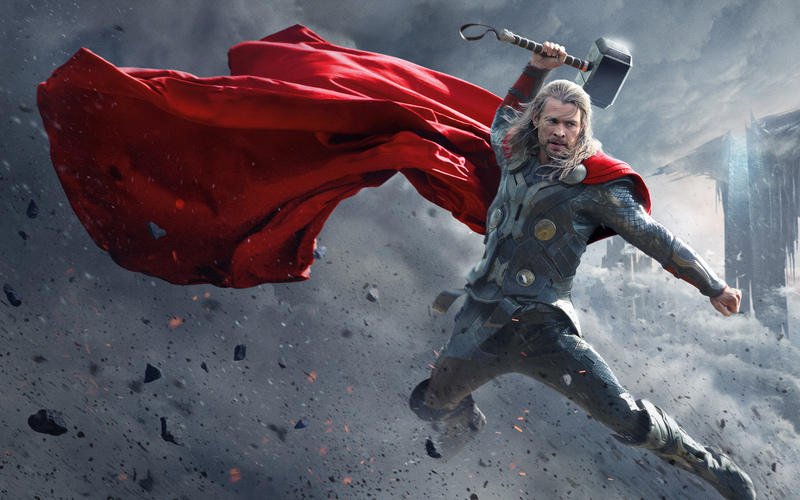 In many ways, Thor: The Dark World is the most comic book reverent superhero film since the Avengers assembled. Little touches such as Odin’s birds and references to Bor are welcome nods, but most impressive is the deepening of the mythology and the exploration of (some of) the Nine Realms (Asgard is far more layered this time round too). It’s a unique, otherworldly playground for the next stage of Thor’s journey. Gone is the arrogant prince of the first movie, replaced with a more mature King-in-waiting. The conversations with Odin reflect the character’s growth, as he begins to understand the responsibilities that come with the throne. Predictably however, it’s the dynamic between Thor and Loki that is the most enjoyable to watch. Whilst the God of Mischief’s motives in Avengers were specific, here his allegiance is ambiguous. Hiddleston accepts the challenge with relish, helped by a wonderfully written script which adds new dimensions to the fan-favourite character, and the dialogue that emanates from the bromance is frequently laugh-out-loud funny. In fact, that idiom can be applied to much of The Dark World, which arguably has the most uproarious scene in any Marvel movie to date. With that said, Kat Dennings’ Darcy goes from genuinely funny to irritating far too often, whilst at times Marvel’s predilection for humour is misplaced, a problem which was incidentally also inherent in Iron Man 3. When it comes time for Thor to put the hammer down, The Dark World gives us the best use of Odinson’s powers yet. The action sequences are brilliantly executed and suitably epic – the elaborate climactic battle being particularly impressive – and in quintessential villains Malekith and Kurse (Adewale Akinnuoye-Agbaje), the hammer-wielding God faces a legitimate threat. In much the same way as Hugh Jackman’s Wolverine or Robert Downey Jr.’s Tony Stark, Hemsworth has taken such ownership of Thor that it’s difficult to imagine anyone else playing him. He is an engaging presence throughout, but it’s when he is paired with Hiddleston’s Loki that we get the film’s best moments. Elsewhere Natalie Portman’s Jane Foster is smartly given more to do without her screen time feeling forced, but it’s a shame we don’t get to see more of Lady Sif (Jaimie Alexander) and the Warriors Three, who are restricted to fleeting, if entertaining moments. Nonetheless, Thor: The Dark World is an ambitious, thrilling and often hilarious superhero sequel. Iron Man got things off to a great start, but now Marvel’s ‘Phase Two’ is in full swing. ANOTHER!